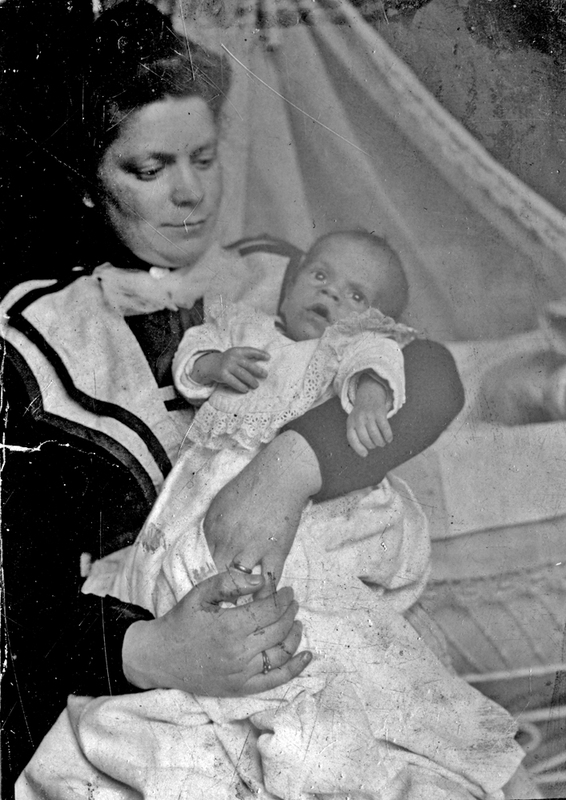 A mother, well dressed, holds her baby up to the camera. Her expression could be one calm pride and achievement. The baby, meanwhile, looks up at the light. Might this be a post-mortem photograph? The baby's somewhat vacant stare not being one of lack of focus, but fixed in death? The mother's dark clothing indicating mourning, and her expression one of resignation and grief? My feeling is that the baby is alive and well, given its relaxed pose and its open fingers (a dead baby would normally have its arms by its side, or crossed over its belly). That there is a net stretched over a cot in the background is also a good sign, I think.